Cooking lobster tails is far easier than cooking live whole lobsters. 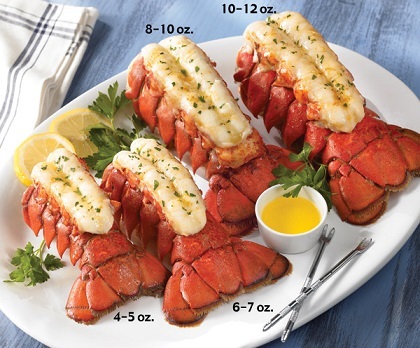 Lobster tails are easier to buy and, although costly, less so than purchasing a whole lobster especially when you consider that most of the lobster meat is in the tail (also the claws, but not the body). Most people I know, at the restaurant and at home, find it more enjoyable eating a lobster tail than trying to "wrestle" with a whole lobster. When I want to prepare a meal with lobster, I purchase flash frozen tails. 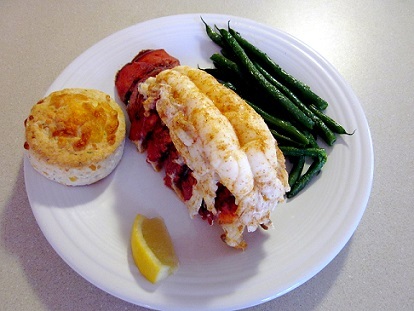 Cooking lobster tails properly will still produce firm and tender lobster. There are some things to know about buying lobster tails. First, a lobster tail from a clawless species of lobster is absolutely fine. Their tails generally have more meat than the clawed lobster. If you are purchasing a live whole lobster, then the clawed species is best since the claws will contain a good amount of meat. For this reason, most of the frozen lobster tails come from the spiny clawless species of lobster. I don't purchase warm water lobster tails. Cold water lobsters are almost always of better quality in terms of the firmness, color, texture and end taste of the meat. Cold water lobster tails will cost more, but if you want to prepare a very special meal you certainly do not want to be disappointed. When you go to a store or fish market, make certain the tails are labeled "cold water." If they are not, ask if they are cold water. If they answer is "I don't know" or if the price is too good to be true, assume the tails are from warm water lobsters. Quality cold water tails are rarely on sale. Finally, if there is any discoloring of the lobster meat (black or gray spots), take a "pass," don't purchase those. If you're going to be cooking lobster tails, what size should you purchase? This depends on the answers to two questions: Are you buying them as the only entree or are you serving them with another entree such as a steak ("Surf and Turf")? A 4-5 ounce tail is great with a steak. How much do you want to spend? Usually the larger the tail, the more expensive it will be. Okay, you've purchased your frozen, cold water lobster tail. Now, how to cook lobster tails? It is possible to cook the tails while still frozen, but I would advise you to defrost them first. By doing so, you improve your chances of obtaining a great result. You can defrost them by leaving them in the refrigerator for about 10 - 12 hours or you can place them in a bowl of cold water, and have the cold water running into the bowl until the job is done. I advise against trying to defrost them in the microwave. You run a good chance of cooking the tails, not just defrosting them. 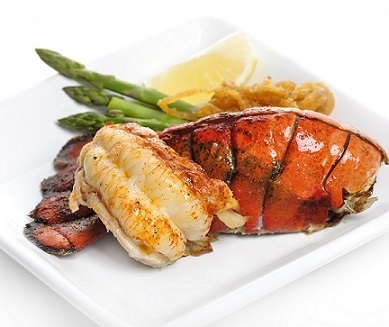 Lobster tails can be boiled, steamed, grilled, broiled or baked. I usually prefer boiling or steaming them. Lobster shells turn red and the meat becomes white when they are done. To cook lobster by boiling, you first need to insert a wooden skewer down the length of each lobster tail so they will not curl during the cooking process. plate the lobster tails and serve immediately with... clarified butter and a lemon wedge or lemon herb butter! To cook lobster by steaming, you first need to insert a wooden skewer down the length of each lobster tail so they will not curl during the cooking process. You will also need a pot with a lid and a rack or collapsible steamer that fits into the pot. To cook lobster by first boiling and then grilling, insert a wooden skewer down the length of each lobster tail to prevent curling. Enjoy cooking lobster and eating a real culinary treat and enjoy the company of those you share it with! "A truly destitute man is not one without riches, but the poor wretch who has never partaken of lobster."